Many nonprofits end their benefit auctions with dancing from either a DJ or a live band. Traditionally there are two standard layouts for this type of event, and both are poor. The dance floor becomes the area from which the auctioneer works. The auctioneer is on a stage and a huge dance floor (a feature which isn’t used but for the last 90 minutes of the event!) is positioned in a top location, directly in front of the stage. Neither of these options works because neither set-up helps your auctioneer build rapport. I’ll even say that “dividing” the audience to the left and right of the dance floor destroys the community and energy you are desire to create! 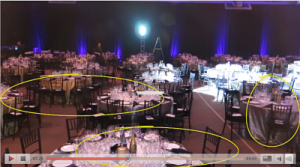 Watch this video for the best way to set up your dinner auction ballroom when a dance floor is involved. Got your own ideas? Share below. Very helpful tips on dealing with the floorplan for an event. Our fundraiser auction is more like a mixer with limited seating. However, we have the same issue with the dance floor. Some of the space is used for food service, silent auction, and other fundraising activities. We could do the same idea by using hightop tables scattered around the dance floor. Other suggestions on getting the crowd gathered by the stage? Theo, are you able to put a few rows of theater-style seating on the dance floor, with high boy tables behind that? The chairs could be removed once the auction is over. I’m a fan of having some seating for older guests, those with bad backs, and women wearing heels. Go to this blog post on Alternatives to the Sit Down Dinner Gala and specifically look at variation 6.